Ambassador Morgenthau's Story. 1918. Chapter Twelve. Soon after the bombardment of Odessa I was closeted with Enver, discussing the subject which was then uppermost in the minds of all the foreigners in Turkey. How would the Government treat its resident enemies? Would it intern them, establish concentration camps, pursue them with German malignity, and perhaps apply the favourite Turkish measure with Christians---torture and massacre? Thousands of enemy subjects were then living in the Ottoman Empire; many of them had spent their whole lives there; others had even been born on Ottoman soil. All these people, when Turkey entered the war, had every reason to expect the harshest kind of treatment. It is no exaggeration to say that most of them lived in constant fear of murder. The Dardanelles had been closed, so that there was little chance that outside help could reach these aliens; the capitulatory rights, under which they had lived for centuries, had been abrogated. There was. really nothing between the foreign residents and destruction except the American flag. The state of war had now made me, as American Ambassador, the protector of all British, French, Serbian, and Belgian subjects. I realized from the beginning that my task would be a difficult one. On one hand were the Germans, urging their well-known ideas of repression and brutality, while on the other were the Turks, with their traditional hatred of Christians and their natural instinct to maltreat those who are helplessly placed in their power. Yet I had certain strong arguments on my side and I now had called upon Enver for the purpose of laying them before him. Turkey desired the good opinion of the United States, and hoped, after the war, to find support among American financiers. At that time all the embassies in Constantinople took it for granted that the United States would be the peacemaker; if Turkey expected us to be her friend, I now told Enver, she would have to treat enemy foreigners in a civilized way. "You hope to be reinstated as a world power," I said. "You must remember that the civilized world will carefully watch you; your future status will depend on how you conduct yourself in war." The ruling classes among the Turks, including Enver, realized that the outside world regarded them as a people who had no respect for the sacredness of human life or the finer emotions and they keenly resented this attitude. I now reminded Enver that Turkey had a splendid opportunity to disprove all these criticisms. "The world may say you are barbarians," I argued; "show by the way you treat these alien enemies that you are not. Only in this way can you be freed permanently from the ignominy of the capitulations. Prove that you are worthy of being emancipated from foreign tutelage. Be civilized, be modern!" "Modern! No; however Turkey shall wage war, at least we shall not be 'modern.' That is the most barbaric system of all. We shall simply try to be decent! " Naturally I construed this as a promise; I understood the changeableness of the Turkish character well enough, however, to know that more than a promise was necessary. The Germans were constantly prodding the Turkish officials, persuading them to adopt the favourite German plan against enemy aliens. Germany has revived many of the principles of ancient and medieval warfare, one of her most barbaric resurrections from the past being this practice of keeping certain representatives of the population, preferably people of distinction and influence, as hostages for the "good behaviour " of others. At this moment the German military staff was urging the Turks to keep foreign residents for this purpose. Just as the Germans held noncombatants in Belgium as security for the "friendliness" of the Belgians, and placed Belgian women and children at the head of their advancing armies, so the Germans in Turkey were now planning to use French and British residents as part of their protective system against the Allied fleet. That this sinister influence was constantly at work I well knew; therefore it was necessary that I should meet it immediately, and, if possible, gain the upper hand at the very start. I decided that the departure of the Entente diplomats and residents from Constantinople would really put to the test my ability to protect the foreign residents. If all the French and English who really wished to leave could safely get out of Turkey, I believed that this demonstration would have a restraining influence, not only upon the Germans, but upon the underlings of the Turkish official world. As soon as I arrived at the railroad station, the day following the break, I saw that my task was to be a difficult one. I had arranged with the Turkish authorities for two trains; one for the English and French residents, which was to leave at seven o'clock, and one for the diplomats and their staff, which was to go at nine. But the arrangement was not working according to schedule. The station was a surging mass of excited and frightened people; the police were there in full force, pushing the crowds back; the scene was an indescribable mixture of soldiers, gendarmes, diplomats, baggage, and Turkish functionaries. One of the most conspicuous figures was Bedri Bey, prefect of police, a lawyer politician, who had recently been elevated to this position, and who keenly realized the importance of his new office. Bedri was an intimate friend and political subordinate of Talaat and one of his most valuable tools. He ranked high in the Committee of Union and Progress, and aspired ultimately to obtain a cabinet position. Perhaps his most impelling motive was his hatred of foreigners and foreign influence. In his eyes Turkey was the land exclusively of the Turks; he despised all the other elements in its population, and he particularly resented the control which the foreign embassies had for years exerted in the domestic concerns of his country. Indeed, there were few men in Turkey with whom the permanent abolition of the capitulations was such a serious matter. Naturally in the next few months I saw much of Bedri; he was constantly crossing my path, taking an almost malicious pleasure in interfering with every move which I made in the interest of the foreigners. His attitude was half provoking, half jocular; we were always trying to outwit each other---I attempting to protect the French and British, Bedri always turning up as an obstacle to my efforts; the fight for the foreigners, indeed, almost degenerated into a personal duel between the Prefect of Police and the American Embassy. Bedri was capable, well educated, very agile, and not particularly ill-natured, but he loved to toy with a helpless foreigner. Naturally, he found his occupation this evening a congenial one. "What's all the trouble about?" I asked Bedri. "We have changed our minds," he said, and his manner showed that the change had not been displeasing to him. "We shall let the train go that is to take the ambassadors and their staffs. But we have decided not to let the unofficial classes leave---the train that was to take them will not go." My staff and I had worked hard to get this safe passage for the enemy nationals. Now apparently some influence had negatived our efforts. This sudden change in plans was producing the utmost confusion and consternation. At the station there were two "groups of passengers, one of which could go and the other of which could not. The British and French ambassadors did not wish to leave their nationals behind, and the latter refused to believe that their train, which the Turkish officials had definitely promised, would not start sometime that evening. I immediately called up Enver, who substantiated Bedri's statement. Turkey had many subjects in Egypt, he said., whose situation was causing great anxiety. Before the French and English residents could leave Turkey, assurances must be given that the rights of Turkish subjects in these countries would be protected. I had no difficulty in arranging this detail, for Sir Louis Mallet immediately gave the necessary assurances. However, this did not settle the matter; indeed, it had been little more than a pretext. Bedri still refused to let the train start; the order holding it up, he said, could not be rescinded, for that would now disarrange the general schedule and might cause accidents. I recognized all this as mere Turkish evasion and I knew that the order had come from a higher source than Bedri; still nothing could be done at that moment. Moreover, Bedri would let no one get on the diplomatic train until I had personally identified him. So I had to stand at a little gate, and pass upon each applicant. Everyone, whether he belonged to the diplomatic corps or not, attempted to force himself through this narrow passageway, and we had an old-fashioned Brooklyn Bridge crush on a small scale. People were running in all directions, checking baggage, purchasing tickets, arguing with officials, consoling distracted women and frightened children, while Bedri, calm and collected, watched the whole pandemonium with an unsympathetic smile. Hats were knocked off, clothing was torn, and, to add to the confusion, Mallet, the British Ambassador, became involved in a set-to with an officious Turk---the Englishman winning first honours easily; and I caught a glimpse of Bompard, the French Ambassador, vigorously shaking a Turkish policeman. One lady dropped her baby in my arms, later another handed me a small boy, and still later, when I was standing at the gate, identifying Turkey's departing guests, one of the British secretaries made me the custodian of his dog. Meanwhile, Sir Louis Mallet became obstreperous and refused to leave. Fig. 21. 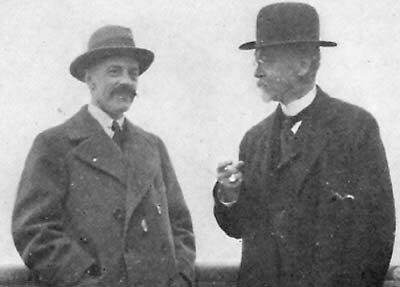 SIR LOUIS MALLET (On the left.) British Ambassador in Constantinople when the war began. "I shall stay here," he said, "until the last British subject leaves Turkey." But I told him that he was no longer the protector of the British; that I, as American Ambassador, had assumed this responsibility; and that I could hardly assert myself in this capacity if he remained in Constantinople. "Certainly," I said, "the Turks would not recognize me as in charge of British interests if you remain here." Moreover, I suggested that he remain at Dedeagatch for a few days, and await the arrival of his fellow British. Sir Louis reluctantly accepted my point of view and boarded the train. As the train left the station I caught my final glimpse of the British Ambassador, sitting in a private car, almost buried in a mass of trunks, satchels, boxes, and diplomatic pouches, surrounded by his embassy staff, and sympathetically watched by his secretary's dog. The unofficial foreigners remained in the station several hours, hoping that, at the last moment, they would be permitted to go. Bedri, however, was inexorable. Their position was almost desperate. They had given up their quarters in Constantinople, and now found themselves practically stranded. Some were taken in by friends for the night, others found accommodations in hotels. But their situation caused the utmost anxiety. Evidently, despite all official promises, Turkey was determined to keep these foreign residents as hostages. On the one hand were Enver and Talaat, telling me that they intended to conduct their war in a humane manner, and, on the other, were their underlings, such as Bedri, behaving in a fashion that negatived all these civilized pretensions. The fact was that the officials were quarrelling among themselves about the treatment of foreigners; and the German General Staff was telling the Cabinet that they were making a great mistake in showing any leniency to their enemy aliens. Finally, I succeeded in making arrangements for them to leave the following day. Bedri, in more complaisant mood, spent that afternoon at the embassy, viséing passports; we both went to the station in the evening and started the train safely toward Dedeagatch. I gave a box of candy---"Turkish Delights," to each one of the fifty women and children on the train; it altogether was a happy party and they made no attempt to hide their relief at leaving Turkey. At Dedeagatch they met the diplomatic corps, and the reunion that took place, I afterward learned, was extremely touching. I was made happy by receiving many testimonials of their gratitude, in particular a letter, signed by more than a hundred, expressing their thanks to Mrs. Morgenthau, the embassy staff, and myself. There were still many who wished to go and next day I called on Talaat in their behalf. I found him in one of his most gracious moods. The Cabinet, he said, had carefully considered the whole matter of English and French residents in Turkey, and my arguments, he added, had greatly influenced them. They had reached the formal decision that enemy aliens could leave or remain, as they preferred. There would be no concentration camps, civilians could pursue their usual business in peace, and, so long as they behaved themselves, they would not be molested. "We propose to show," said Talaat, "by our treatment of aliens, that we are not a race of barbarians." In return for this promise he asked a favour of me: would I not see that Turkey was praised in the American and European press for this decision? After returning to the embassy I immediately sent for Mr. Theron Damon, correspondent of the Associated Press, Doctor Lederer, correspondent of the Berliner Tageblatt, and Doctor Sandler, who represented the Paris Herald, and gave them interviews, praising the attitude of Turkey toward the foreign residents. I also cabled the news to Washington, London, and Paris and to all our consuls. Hardly had I finished with the correspondents when I again received alarming news. I had arranged for another train that evening, and I now heard that the Turks were refusing to visé the passports of those whose departure I had provided for. This news, coming right after Talaat's explicit promise, was naturally disturbing. I immediately started for the railroad station, and the sight which I saw there increased my anger at the Minister of the Interior. A mass of distracted people filled the inclosure; the women were weeping, and the children were screaming, while a platoon of Turkish soldiers, commanded by an undersized popinjay of a major, was driving everybody out of the station with the flat sides of their guns. Bedri, as usual, was there, and as usual, he was clearly enjoying the confusion; certain of the passengers, he told me, had not paid their income tax, and, for this reason, they would not be permitted to leave. I announced that I would be personally responsible for this payment. "I can't get ahead of you, Mr. Ambassador, can I?" said Bedri, with a laugh. From this we all thought that my offer had settled the matter and that the train would leave according to schedule. But then suddenly, came another order holding it up again. Since I had just had a promise from Talaat I decided to find that functionary and learn what all this meant. I jumped into my automobile and went to the Sublime Porte, where he usually had his headquarters. Finding no one there, I told the chauffeur to drive directly to Talaat's house. Sometime before I had visited Enver in his domestic surroundings and this occasion now gave me the opportunity to compare his manner of life with that of his more powerful associate. The contrast was a startling one. I had found Enver living in luxury, in one of the most aristocratic parts of the town, while now I was driving to one of the poorer sections. We came to a narrow street, bordered by little rough, unpainted wooden houses; only one thing distinguished this thoroughfare from all others in Constantinople and suggested that it was the abiding place of the most powerful man in the Turkish Empire. At either end stood a policeman, letting no one enter who could not give a satisfactory reason for doing so. Our auto, like all others, was stopped, but we were promptly permitted to pass when we explained who we were. As contrasted with Enver's palace, with its innumerable rooms and gorgeous furniture, Talaat's house was an old, rickety, wooden, three-story building. All this, I afterward learned, was part of the setting which Talaat had staged for his career. Like many an American politician, he had found his position as a man of "the people" a valuable political asset, and he knew that a sudden display of prosperity and ostentation would weaken his influence with the Union and Progress Committee, most of whose members, like himself, had risen from the lower walks of life. The contents of the house were quite in keeping with the exterior. There were no suggestions of Oriental magnificence. The furniture was cheap; a few coarse prints hung on the walls, and one or two well-worn rugs were scattered on the floor. On one side stood a wooden table, and on this rested a telegraph instrument---once Talaat's means of earning a living, and now a means by which he communicated with his associates. In the present troubled conditions in Turkey Talaat sometimes preferred to do his own telegraphing! Amid these surroundings I awaited for a few minutes the entrance of the Big Boss of Turkey. In due time a door opened at the other end of the room, and a huge, lumbering, gaily-decorated figure entered. I was startled by the contrast which this Talaat presented to the one who had become such a familiar figure to me at the Sublime Porte. It was no longer the Talaat of the European clothes and the thin veneer of European manners; the man whom I now saw looked like a real Bulgarian gypsy. Talaat wore the usual red Turkish fez; the rest of his bulky form was clothed in thick gray pajamas; and from this combination protruded a rotund, smiling face. His mood was half genial, half deprecating; Talaat well understood what pressing business had led me to invade his domestic privacy, and his behaviour now resembled that of the unrepentant bad boy in school. He came and sat down with a good-natured grin, and began to make excuses. Quietly the door opened again, and a hesitating little girl was pushed into the room, bringing a tray of cigarettes and coffee. Presently I saw that a young woman, apparently about twenty-five years old, was standing back of the child, urging her to enter. Here, then, were Talaat's wife and adopted daughter; I had already discovered that, while Turkish women never enter society or act as hostesses, they are extremely inquisitive about their husbands' guests, and like to get surreptitious glimpses of them. Evidently Madame Talaat, on this occasion, was not satisfied with her preliminary view, for, a few minutes afterward, she appeared at a window directly opposite me, but entirely unseen by her husband, who was facing in the other direction, and there she remained very quiet and very observant for several minutes. As she was in the house, she was unveiled; her face was handsome and intelligent; and it was quite apparent that she enjoyed this close-range view of an American ambassador. "Well, Talaat," I said, realizing that the time had come for plain speaking, "don't you know how foolishly you are acting? You told me a few hours ago that you had decided to treat the French and English decently and you asked me to publish this news in the American and foreign press. I at once called in the newspaper men and told them how splendidly you were behaving. And this at your own request! The whole world will be reading about it to-morrow. Now you are doing your best to counteract all my efforts in your behalf; here you have repudiated your first promise to be decent. Are you going to keep the promises you made me? Will you stick to them, or do you intend to keep changing your mind all the time? Now let's have a real understanding. The thing we Americans particularly pride ourselves on is keeping our word. We do it as individuals and as a nation. We refuse to deal with people as equals who do not do this. You might as well understand now that we can do no business with each other unless I can depend on your promises." "Now, this isn't my fault," Talaat answered. "The Germans are to blame for stopping that train. The German Chief of Staff has just returned and is making a big fuss, saying that we are too easy with the French and English and that we must not let them go away. He says that we must keep them for hostages. It was his interference that did this." That was precisely what I had suspected. 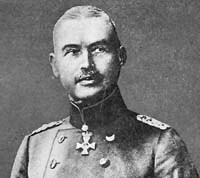 Talaat had given me his promise, then Bronssart, head of the German Staff, had practically countermanded his orders. Talaat's admission gave me the opening which I had wished for. By this time my relations with Talaat had become so friendly that I could talk to him with the utmost frankness. "Now, Talaat," I said, "you have got to have someone to advise you in your relations with foreigners. You must make up your mind whether you want me or the German Staff. Don't you think you will make a mistake if you place yourself entirely in the hands of the Germans? The time may come when you will need me against them." "What do you mean by that?" he asked, watching for my answer with intense curiosity. "The Germans are sure to ask you to do many things you don't want to do. If you can tell them that the American Ambassador objects, my support may prove useful to you. Besides, you know you all expect peace in a few months. You know that the Germans really care nothing for Turkey, and certainly you have no claims on the Allies for assistance. There is only one nation in the world that you can look to as a disinterested friend and that is the United States." Fig. 23. 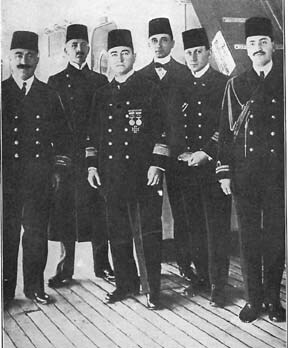 GERMAN AND TURKISH OFFICERS ON BOARD THE "GOEBEN " All the men, except the ones at the extreme left and extreme right, are Germans. Two months before Turkey entered the European war, Admiral Souchon---the central figure in this group---controlled the Turkish navy. This fact was so apparent that I hardly needed to argue it in any great detail. However, I had another argument that struck still nearer home. Already the struggle between the war department and the civil powers had started. I knew that Talaat, although he was Minister of the Interior, and a civilian, was determined not to sacrifice a tittle of his authority to Enver, the Germans, and the representatives of the military. "If you let the Germans win this point to-day," I said, "you are practically in their power. You are now the head of affairs, but you are still a civilian. Are you going to let the military, represented by Enver and the German staff, overrule your orders? Apparently that is what has. happened to-day. If you submit to it, you will find that they will be running things from now on. The Germans will put this country under martial law; then where will you civilians be?" I could see that this argument was having its effect on Talaat. He remained quiet for a few moments, evidently pondering my remarks. Then he said, with the utmost deliberation, "I am going to help you." "The English bombarded the Dardanelles this morning and killed two Turks!" "We intend to kill three Christians for every Moslem killed!" Fig. 24. 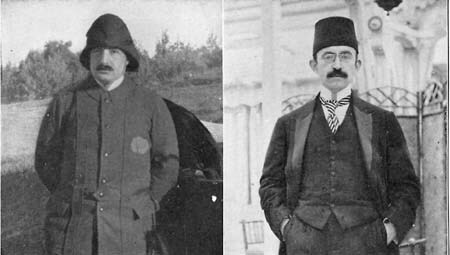 (left) BEDRI BEY, PREFECT OF POLICE AT CONSTANTINOPLE/ A leader of the Young Turks and an intimate friend of Talaat. Mr. Morgenthau's attempts to protect the English and French became a contest between himself and Bedri, who accepted the German view that foreigners should not be treated with "too great leniency "
(Right) DJAVID BEY, MINISTER OF FINANCE IN TURKISH CABINET. A Jew by race but a Mohammedan by religion; an influential member of the Young Turk party. He was Pro-Ally in his sympathies, and resigned when Turkey entered the war on Germany's side, though afterward he resumed office. For a moment I thought that everything was lost. Talaat's face reflected only one emotion---hatred of the English. Afterward, when reading the Cromer report on the Dardanelles, I found that the British Committee stigmatized this early attack as a mistake, since it gave the Turks an early warning of their plans. I can testify that it was a mistake for another reason, for I now found that these few strange shots almost destroyed my plans to get the foreign residents out of Turkey. Talaat was enraged, and I had to go over much of the ground again, but finally I succeeded in pacifying him once more. I saw that he was vacillating between his desire to punish the English and his desire to assert his own authority over that of Enver and the Germans. Fortunately the latter motive gained the ascendancy. At all hazard, he was determined to show that he was boss. We remained there more than two hours, my involuntary host pausing now and then in his telegraphing to entertain me with the latest political gossip. Djavid, the Minister of Finance, he said, had resigned, but had promised to work for them at home. The Grand Vizier, despite his threats, had been persuaded to retain his office. Foreigners in the interior would not be molested unless Beirut, Alexandretta, or some unfortified port were bombarded, but, if such attacks were made, they would exact reprisals of the French and English. Talaat's conversation showed that he had no particular liking for the Germans. They were overbearing and insolent, he said, constantly interfering in military matters and treating the Turks with disdain. Finally the train was arranged. Talaat had shown several moods in this interview; he had been by turns sulky, good-natured, savage, and complaisant. There is one phase of the Turkish character which Westerners do not comprehend and that is its keen sense of humour. Talaat himself greatly loved a joke and a funny story. Now that he had reestablished friendly relations and redeemed his promise, Talaat became jocular once more. "Your people can go now," he said with a laugh. "It's time to buy your candies, Mr. Ambassador!" This latter, of course, was a reference to the little gifts which I had made to the women and children the night before. We immediately returned to the station, where we found the disconsolate passengers sitting around waiting for a favourable word. When I told them that the train would leave that evening, their thanks and gratitude were overwhelming.